So Apple launches the thinnest & slimmest phone yet again, the iPhone.. Ohh wait it's not Apple, this time It's Micromax. Manufacturing a slimmer & thinner phone than the competition usually requires great efforts as the engineers have to fit the latest and greatest specs in that tiny little body. Although not adding any extra weight. This in turn affects the battery life or your device suffers minors scuffs, even when it falls down from lesser heights. But so far many companies have done a great job in this department. Let's see if Micromax's latest offering : Canvas Silver 5 can stay upto it's pride. You probably would've seen those hugh Jackman commercials on YouTube. It has a 1.2GHz 64-bit Snapdragon 410 Quad Core Processor coupled with Adreno 306 GPU & 2GB DDR3 Ram. It has a 4.8inch HD(1280X720) AMOLED screen backed up by Corning Gorilla Glass 3. It has a 8MP(Sony IMX219 CMOS Sensor) Primary Camera capable of 1080P video at 30 FPS. While the Secondary front camera is 5MP FF Shooter. It's equipped with NXP Smart Power Amplifier and Dirac HD sound. Has an 2000mAh Lithium Polymer battery. It has about 16GB of on-board storage. It'll run on Android lollipop 5.0, although I'm not sure whether it'll be receiving the future Android M updates. Well this is what Micromax flaunts off in many commercials that they've shown, accompanying hugh Jackman on board. Whole point is about the design, Canvas sliver 5 weighs only about 97gms & is only 5.1mm thick in size, Which makes it the both the slimmest & thinnest Device to date. It has a Aircraft Grade Aluminium chassis, this makes the Canvas Sliver 5 robust as well as light weight. 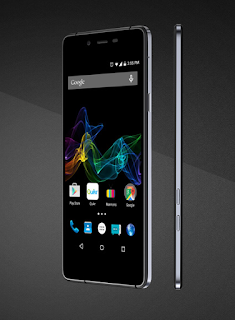 Micromax claims that, it's world's 1st 4G LTE phone below 100gms. Quicknote : For you Camera fanatics, yes you can manually control ISO, exposure via in-built software gimmcicks like professional mode, night shot and horizontal Panorama shot. Well the phone even comes with the usual bloatware as usually micromax phones come along with it, I would appreciate if there was a way to uninstall that bloatware(Pre-installed Apps) Just like Windows Phone( Bloatware can be uninstalled in Windows Phones). Housing, Hotstar App, Center, Quikr, Scandid, Clean master, Snapdeal, NewsHunt, Chaatz, Swiftkey Apps. Fun fact : Don't pronounce it as Canvas Silver 5, because it's sliver 5. But is it a better buy ? Well i'm stuck in a real dilemma after the news regarding Moto G 2015. Also See : Coolpad launches dazen 1 : A tough competitor to yuphoria !